Add all ingredients, with ice, to a cocktail shaker. Shake vigorously for 10 seconds and double strain into a chilled Georgian Irish Coffee glass. Top with grated nutmeg. *20g of salt dissolved in 80g of water. In a large lidded jar, combine 1 bottle of rum with 250g sliced banana (about 2 large bananas) and 125g Golden Raisins. Store in a dark area for 4 days, shaking daily. (Or, sous-vide for 1½ hours at 170 degrees). Strain through a nut bag into the original bottle and discard the solids. Add 2 split vanilla beans to 15 oz. of near-boiling water. Add 15 oz. (by weight) of Demerara sugar and stir until dissolved. Pour the syrup and vanilla beans into a clean bottle and store in the refrigerator. Steep 32g of Chai Tea in 18 oz. of near-boiling water for 5 minutes. Strain through a fine mesh sieve, discarding the solids. Make note of the volume of brewed tea and add an equal amount (by weight) of Demerara sugar. (You’ll lose about 2 oz. of liquid in the steeping process). Stir until dissolved and pour into a clean bottle and store in the refrigerator. Madison’s Ryan Williams shares his recipe for this amazing rum cocktail. 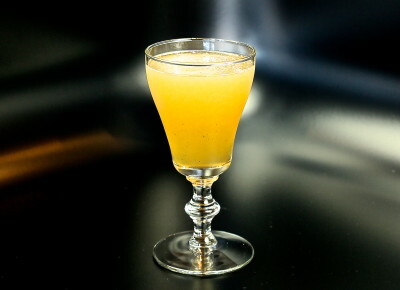 Created for the menu at Merchant, this uber-popular concoction might well have been the cause for the spike in banana prices during the summer of 2016, as much of the Midwest’s allotment of that fruit ended up on the loading dock at that cocktail emporium. Sweet and fun, this cocktail is a true delight! Don’t let the mix of specialty syrups and rum deter you as they’re simple to prepare and can substitute into many of your favorite cocktails. Be certain to check out Ryan’s Negroni Fizz for yet another grand creation. Cheers!